Throughout the tutorial, coloured text will be used to refer to questions or instructions and/or PyMOL commands. This is a question prompt: try answering it! This is an instruction prompt: follow it! This is a PyMol prompt: write this in the PyMol command line prompt! This is a Linux prompt: insert the commands in the terminal! Also, if not provided with special workshop credentials to use the HADDOCK portal, make sure to register in order to be able to submit jobs. Use for this our registration page. HADDOCK (see http://www.bonvinlab.org/software/haddock2.2/haddock.html) is a collection of python scripts derived from ARIA (http://aria.pasteur.fr) that harness the power of CNS (Crystallography and NMR System – http://cns-online.org) for structure calculation of molecular complexes. What distinguishes HADDOCK from other docking software is its ability, inherited from CNS, to incorporate experimental data as restraints and use these to guide the docking process alongside traditional energetics and shape complementarity. Moreover, the intimate coupling with CNS endows HADDOCK with the ability to actually produce models of sufficient quality to be archived in the Protein Data Bank. The final models are automatically clustered based on a specific similarity measure - either the positional interface ligand RMSD (iL-RMSD) that captures conformational changes about the interface by fitting on the interface of the receptor (the first molecule) and calculating the RMSDs on the interface of the smaller partner, or the fraction of common contacts (current default) that measures the similarity of the intermolecular contacts. For RMSD clustering, the interface used in the calculation is automatically defined based on an analysis of all contacts made in all models. Osteoporosis affects about 10% of the population in Europe, Japan and North America and its incidence rate is growing with increasing life expectancy. The main feature of osteoporosis is bone loss mediated by osteoclasts and insufficient rebuilding of bone matrix by osteoblasts. A longstanding theory of osteoporosis is that the balance between these two activities has gone off, with bone destruction running ahead. It is very hard to slow down osteoclast activity without slowing down osteoblast activity as well, but one therapy showed promises: the cathepsin K inhibitors. 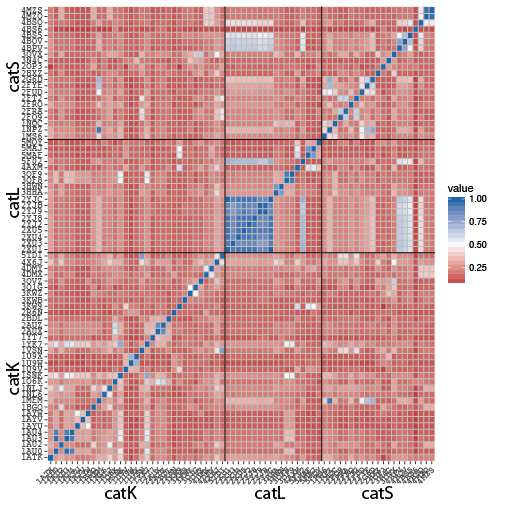 Cathepsin K is a highly potent cysteine protease expressed in osteoclasts. This enzyme is able to break down collagen, elastin, gelatin and other proteins. It is found almost entirely in this cell type, giving a real hope of targeting osteoclasts selectively. At last, protease inhibitors themselves are a type of small molecule that, in general, give good success in drug discovery. For all those reasons, cathepsin K inhibitors have been studied for more than 20 years and several pharmaceutical companies have currently compounds in clinical trials. Figure 1: Purine nitrile derived inhibitor cocrystallized in the cathepsin K active site. PDB code is 1u9v. 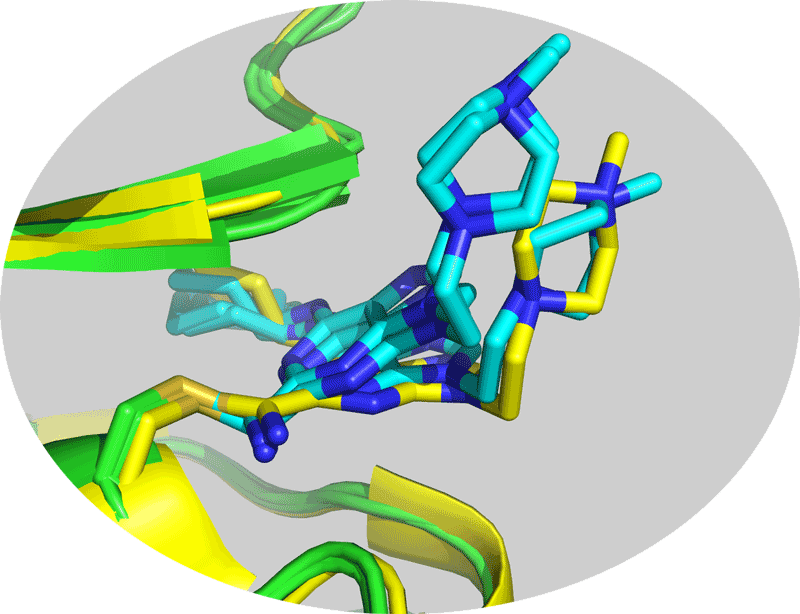 A lot of three-dimensional structures of cathepsins in the presence of small inhibitors are available in the Protein Data Bank. While the crystal structure of this complex is available from the PDB (1U9V), we will perform our docking from alternate conformations crystallized with alternative ligands. Free structures of homologous proteins are known and can be used as templates to model the protein. Typically, sequence similarity, structure resolution and experimental conditions will determine which template is the best to select. Bound structures of homologous proteins are known and can be used to approximate the bound structure of the receptor. Bound structures of the protein with different ligands are known. Assuming we can find either bound structures of close homologous proteins or bound structures of our target protein with different ligands, how would you select the best template for the docking? Based on our previous experience with the D3R challenges, we decided to use ligand similarity to select a protein template for small molecule docking. The similarity metric that we employ is the widely accepted Tanimoto Coefficient (TC). 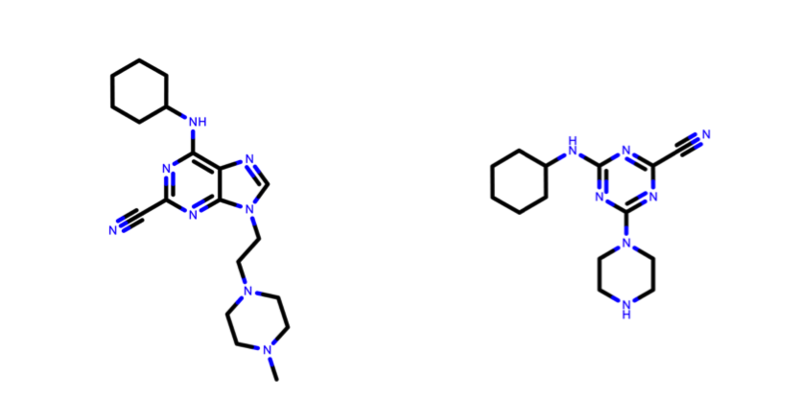 Given two molecules, A and B, depicted in fig. 2 the TC is defined as follows: where TC is the Tanimoto Coefficient, A is the set of atoms of molecule A, B is the set of atoms of molecule B and C is the set of atoms that is shared between the two molecules. The shared set of atoms is depicted in fig. 3 and it is identified by detecting the Maximum Common Substructure (MCS) of the two molecules. Figure 3: How to calculate TC? Maximum Common Substructure shared between the two molecules. The shared atoms are highlighted with a blue background. We decided to choose the closest related templates based on their TC. In the remaining of this tutorial we will work with Cathepsin K, but you are welcome to repeat all steps with Cathepsin L and S, respectively. You should see a backbone representation of the protein (corresponding to chain A in the PDB file) with two additional small molecules and crystal waters. For the ligand, some programs like PRODRG allow you to generate a structure for a chemical directly from a simple sketch in a text editor. However, whenever possible, we advise you to use SMILES or MOL files for the ligand when the atomic coordinates are not available. To illustrate the difficulty of ligand modelling, there is no strict consensus in the algorithms that generate the SMILES strings and each of them choose only one of the main possible strings. 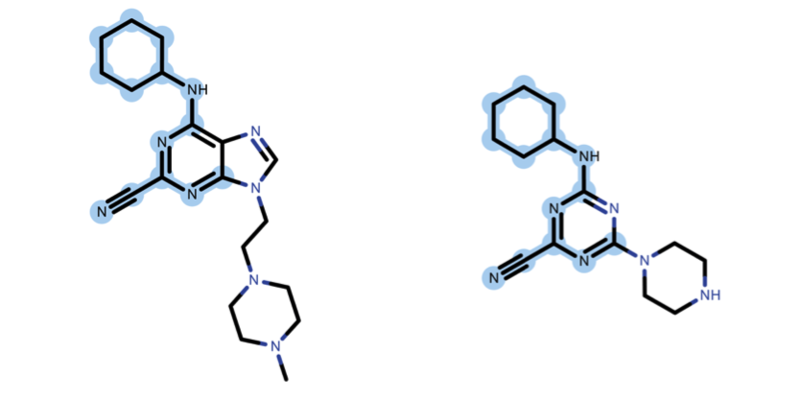 For instance, open the PDBeChem page for our cathepsin K inhibitor and look for the SMILES provided (ACDLabs, CACTVS, OpenEye). What can you say about the consistency between the different SMILES sequences? Can you recognise the different structural groups in the ligand based on the SMILES? Generating and sampling suitable ligand conformations for docking is an art in itself, which we will not cover in this tutorial From our participation to the D3R challenges, we have good experience with the OpenEye Scientific Software suite for which it is possible to request an academic license. For this tutorial we could download a representive PDB file of our ligand from the PDBeChem database. This representative conformation is actually the bound form of the ligand from the 1U9V PDB entry we are aiming at reproducing. This means that effectively in the docking we are going to perform the ligand is in an ideal conformation already. In order to facilitate later on the analysis of the docking results and the comparison with the reference structure, we will however extract the ligand coordinates directly from PDB entry 1U9V since in that way the atom names will match. The last two commands displays the cysteine to which the ligand is covalently bound and zooms on the ligand. Take the time to inspect the structure and look at how the ligand is covalently attached to the protein. Before setting up the docking we need first to generate the distance restraint file for defining the “covalent bond” in a format suitable for HADDOCK. HADDOCK uses CNS as computational engine. A description of the format for the various restraint types supported by HADDOCK can be found in our Nature Protocol paper, Box 4. The syntax for the selections can combine information about chainID - segid keyword -, residue number - resid keyword -, atom name - name keyword. Other keywords can be used in various combinations of OR and AND statements. Please refer for that to the online CNS manual. Can you think of a different way of defining the distance and lower and upper corrections while maintaining the same allowed range? Let’s now define the distance restraints to represent our covalent bond for docking. We will use for that two distance restraints. The first one will be between the sulfur atom of the targeted cysteine and the reactive nitrile carbon of the ligand with a distance set to 1.8Å ± 0.1Å, consistent with the average length of a simple C-S bond. The second distance is defined between the CB of the cysteine and the atom adjacent to the reactive nitrile carbon and is meant to impose the proper angular geometry. This distance is set to 2.8Å ± 0.1Å, (as measured in between the CG and CE atoms of a methionine side-chain as reference). The residue number of the ligand is 300. In the file we previously saved, its chain ID is A, but during docking we will define it as molecule B. You can either create this file yourself using your favorite text editor (BUT NOT Word) or download it from here for convenience. Note that fine-tuning the parameters of the web server to covalently dock a ligand requires the most advanced privilege on the web server. If you did not apply for the “guru” access level yet, it is time to apply for it on our registration portal. If using workshop credentials, you will have “guru” access already. A problem when trying to “covalently dock” a small ligand is that the van der Waals interactions will typically prevent close proximity of the atoms involved in the covalent bond. To allow the distance restraint to be satisfied, we need to scale down the non-bonded interactions between the specific atoms involved in that covalent bond. For this purpose we created a special Cysteine residue (residue name: CYC), without hydrgogen atom on the sulfur and with significantly reduced VDW parameters for the sulfur atom (scaled down by a factor 10). Prior to docking, you need to edit the PDB file of our protein and modify the residue name of cysteine 25 by replacing “CYS A 25” by “CYC A 25”. Step1: Define a name for your docking run, e.g. CatK-ligand. Step2: Input the protein PDB file. For this unfold the First Molecule menu. Step3: Input the ligand PDB file. For this unfold the Second Molecule menu. Step4: Upload the distance restraing file (.tbl). For this unfold the Distance restraints menu. Step5: Change the clustering settings. For this unfold the Parameters for clustering menu. During this stage the PDB and eventually provided restraint files are being validated. Further the server makes use of Molprobity to check side-chain conformations, eventually swap them (e.g. for asparagines) and define the protonation state of histidine residues. Once this has been successfully done, the page will indicated that your job is first QUEUED, and then RUNNING. The page will automatically refresh and the results will appear upon completions (which can take between 1/2 hour to several hours depending on the size of your system and the load of the server). You will be notified by email once your job has successfully completed. Once your run has completed you will be presented with a result page showing the cluster statistics and some graphical representation of the data (and if registered, you will also be notified by email). If using course credentials provided to you, the number of models generated will have been decreased to allow the runs to complete within a reasonable amount of time. Because of that, the results might not be very good, although in this particular case, considering we are using distance restraints to model the covalent bond, we would expect that even the limited sampling should generate reasonable models. Assuming our docking simulations are accurate, what can you say about the average HADDOCK score of the top cluster for the different docking runs? Is is consistent with the IC50 values reported experimentally? It is important to emphasize that the HADDOCK score is not consistently in agreement with IC50 values, this is only a mere coincidence and we hope the collaboration with CPMD can greatly improve our predictions to this regard. We now want to highlight the reactive cysteine (position 25) and the covalently bound ligand in sticks. The ligand as residue name IHE. At last, because HADDOCK added hydrogens to all polar and non-polar atoms, we can remove them to facilitate the visual comparison with the reference structure. alter (resn IHE and 1u9v), chain="B"
Does the best cluster ranked by HADDOCK also correspond to the best (smallest) ligand-RMSD value? Now finally, let’s consider the scores of the three cathepsin-ligand docking runs (CatK, CatL and CatS). Is there any correlation between docking score and IC50s? Note that in general we should not interpret docking scores in terms of binding affinity values. So any correlation observed here does not mean this is generally applicable. In this particular case, considering that the ligand is the same and only rather minor changes are present between the different cathepsin sequences, we do observe a slight correlation. But again, this should not be taken as a rule. We have actually shown that for protein-protein complexes that there is no correlation between the various scoring functions using in docking and binding affinity. P.L. Kastritis and A.M.J.J. Bonvin. Molecular origins of binding affinity: Seeking the Archimedean point. Curr. Opin. Struct. Biol., 23, 868-877 (2013). P.L. Kastritis and A.M.J.J. Bonvin. On the binding affinity of macromolecular interactions: daring to ask why proteins interact J. R. Soc. Interface, 10, doi: 10.1098/rsif.2012.0835 (2013). P. Kastritis and A.M.J.J. 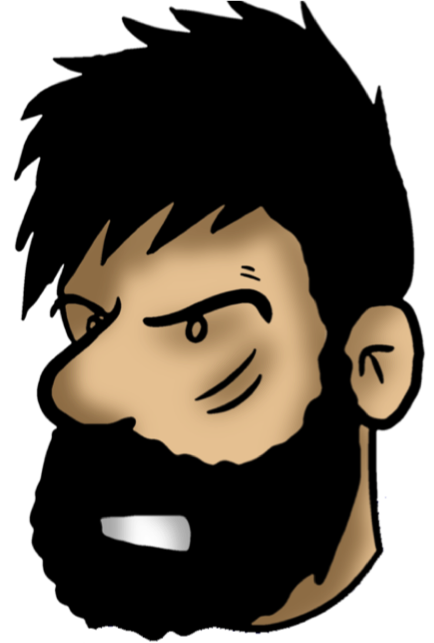 Bonvin. Are scoring functions in protein-protein docking ready to predict interactomes? Clues from a novel binding affinity benchmark. J. Proteome Research, 9, 2216-2225 (2010).